In my neverending search for healthy, tasty lunch options, I came across this in my Olive magazine. It’s Som Tum salad, which I believe is typically made with green papaya, but this version uses tart green apples and green beans. 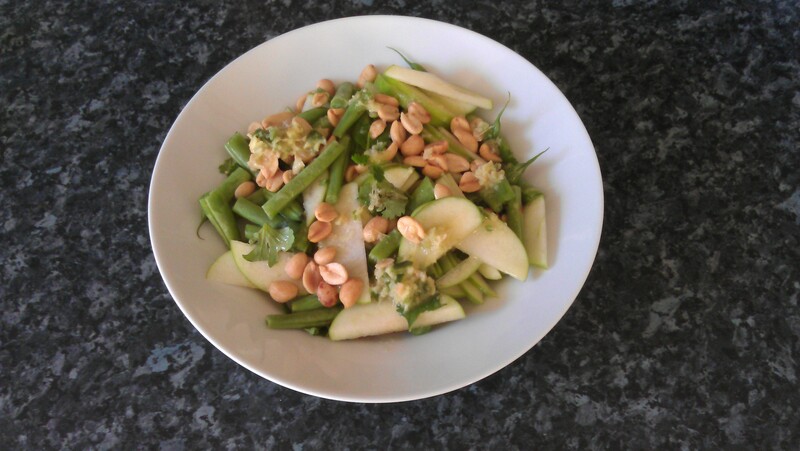 It has really simple ingredients, most of which you probably always have in your house: green beans, green apples (use a tart variety like Granny Smith), peanuts, sugar, ginger, chili, garlic, coriander and fish sauce. The combination is so delicious, even though my work colleagues have complained that it stinks the office out as the aroma rather pungent, but pleasant! The directions are quite simple as well. Just slice an apple per person into thin slices and toss with lime juice. Then batter the green beans into submission with a few bashes with a pestle (you’ll need the mortar as well in a second) and cut into bite size pieces. Then comes the dressing. I put the sugar in the mortar straight away (3 tsp if you’re making two servings) with a roughly chopped red or green chili (deseeded if you don’t want it too spicy), a small handful of peanuts, sliced and peeled ginger (the ever-called-for thumb-sized piece) and a clove of garlic (leave this out if you’re not a fan of raw garlic because it will make your breath pong for a bit after, but this is well worth it in my opinion. Maybe not ideal before a romantic interlude or business meeting, but for a zippy lunch with a good book it fits the bill). Bash it all up together, then add 1 tbsp of fish sauce and the juice of a lime. Test it on a bit of apple for the correct balance – sweet, sour, salty, spicy – and correct if needed. As I usually make this the night before, I wrap the peanuts separately and add them at the last minute because I don’t think they’d fare very well in the fridge overnight. I add the dressing at the last minute as well, but I don’t know what the effect would be of adding it the night before. Let me know if you try it! The apples stay nice and crisp thanks to the lime juice and the green beans (despite the battering they receive) are lovely and crunchy and fresh tasting. It’s an all round winner and despite my colleagues complaints of it making the office smell like a Thai market – which can’t be all bad, can it? – it’s a great fresh, zingy and satisfying lunch or starter. I’ll have to make this for my daughter. She loves green apples and salads.